The Boston Red Sox visit Rogers Centre on Wednesday, August 30, 2017 to play the Toronto Blue Jays. The probable starters are Rick Porcello for the Red Sox and J.A. Happ for the Blue Jays. The opening line for this matchup has Boston at +105 and Toronto at -115. The Red Sox have a 58-67-6 over/under record and a 68-63-0 run line mark. The Blue Jays are 58-73-0 against the run line and have a 61-64-6 over/under record. The Red Sox have a 74-57 overall record this season. Starting pitcher Rick Porcello has a 8-15 record with an earned run average of 4.57 and a WHIP of 1.39. He has 153 strikeouts over his 169.1 innings pitched and he's given up 199 hits. He allows 10.6 hits per 9 innings and he has a FIP of 4.43. The bullpen has an earned run average of 3.27 and they have given up 347 base hits on the year. Teams are hitting .229 against the bullpen and they've struck out 420 hitters and walked 138 batters. As a team, Boston allows 8.5 hits per nine innings while striking out 9.4 batters per nine innings. They are 4th in the league in team earned run average at 3.74. The Red Sox pitchers collectively have given up 1,121 base hits and 493 earned runs. They have allowed 154 home runs this season, ranking them 22nd in the league. Boston as a pitching staff has walked 367 batters and struck out 1,241. They have walked 2.8 men per 9 innings while striking out 9.4 per 9. They have a team WHIP of 1.25 and their FIP as a unit is 3.75. As a team Boston is hitting .262, good for 6th in the league. The Red Sox hold a .412 team slugging percentage and an on-base percentage of .334, which is good for 9th in baseball. They rank 6th in MLB with 9.1 hits per game. Mookie Betts is hitting .263 with an on-base percentage of .342. He has 137 hits this season in 520 at bats with 77 runs batted in. He has a slugging percentage of .438 and an OPS+ of 104. Xander Bogaerts is hitting .276 this year and he has an on-base percentage of .337. He has totaled 128 hits and he has driven in 50 men in 464 at bats. His OPS+ is 95 while his slugging percentage is at .407. The Red Sox have 1,191 hits, including 237 doubles and 139 home runs. Boston has walked 467 times so far this season and they have struck out 965 times as a unit. They have left 928 men on base and have a team OPS of .746. They score 4.81 runs per contest and have scored a total of 630 runs this year. Toronto has a 61-70 overall mark this year. With an earned run average of 4.10, J.A. Happ has a 6-10 record and a 1.36 WHIP. He has 108 strikeouts over the 107.2 innings he's pitched. He's also given up 112 hits. He allows 9.4 hits per nine innings and his FIP stands at 3.88. The bullpen has an earned run average of 4.38 and they have given up 432 base hits on the year. Teams are hitting .239 against the Blue Jays bullpen. Their relievers have struck out 512 batters and walked 180 opposing hitters. As a team, Toronto allows 9.1 hits per nine innings while striking out 8.6 batters per nine innings. They are 18th in the league in team earned run average at 4.59. The Blue Jays pitchers as a team have surrendered 1,189 base knocks and 599 earned runs this season. They have given up 163 home runs this year, which ranks 14th in Major League Baseball. Toronto as a staff has walked 466 hitters and struck out 1,123 batters. They give up a walk 3.6 times per 9 innings while they strike out 8.6 per 9. Their team WHIP is 1.41 while their FIP as a staff is 4.32. As a team, they are batting .242, good for 28th in the league. The Blue Jays hold a .413 team slugging percentage and an on-base percentage of .316, which is good for 22nd in baseball. They rank 27th in MLB with 8.2 hits per contest. Justin Smoak comes into this matchup batting .289 with an OBP of .366. He has 134 hits this year along with 84 RBI in 463 AB's. He maintains a slugging percentage of .575 with an OPS+ of 142. Kevin Pillar is hitting .252 this season and he has an OBP of .300. He has collected 121 hits in 480 at bats while driving in 34 runs. He has an OPS+ of 83 and a slugging percentage of .402. 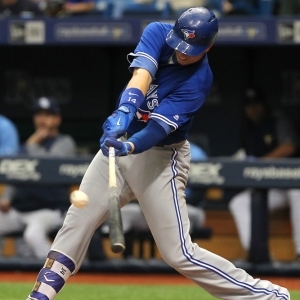 The Blue Jays as a unit have 1,068 base hits, including 208 doubles and 179 homers. Toronto has walked 447 times this year and they have struck out on 1,030 occasions. They have had 873 men left on base and have an OPS of .728. They have scored 4.27 runs per game and totaled 559 runs this season. Who will win tonight's Red Sox/Blue Jays MLB game against the spread?